Plenty of Space! Great Location! Some Woods! A Pond! If you are looking for a home with all these features, then look no further!! 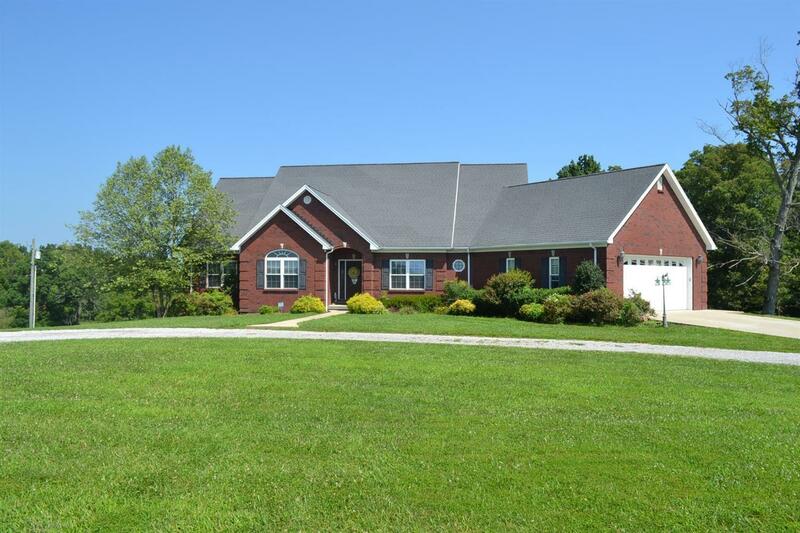 This custom brick home offers 6 bedrooms, 4 1/2 baths, and 2 kitchens with all appliances. Walk through the entry foyer into spacious living area with specialty ceilings, hardwood flooring, sliding glass doors that go out to a large deck overlooking the beautiful 12.76 acres that come with this property. Master bedroom suite with walk in closet, Jacuzzi tub, on main floor along with 2 other bedrooms, dining room, 1 1/2 baths, and laundry room as well. There is a bonus room on second level that could be an extra bedroom or office area. The finished basement has 3 bedrooms, 2 full baths, kitchen, large entertaining area, laundry room, and sliding door out to patio area. Home also has 2 car garage on main level and a garage door in basement. Property has nice yard with app. 4 acres in woods and pond stocked with fish. Call today for a private showing! Firm !!! Miscellaneous: Basement, Foyer, Master Bdrm 1st Flr.,Bedroom 1st Floor, Great Room, Rec Room, Bonus Room, Separate Utility Rm.